Random.org chose Queen Size Funny Bone and bison61 as the winners! Congratulations! 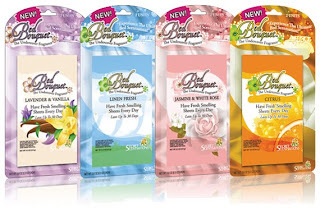 Bed Bouquet is a revolutionary new product desgned to keep your linens smelling fresher longer. Secret Scentsations designed a product that will go physically unnoticed by the person sleeping in the bed, yet will emit a soft fragrance throughout the sheets for weeks. I love these! They are really quite simple, and very thin so that you don't notice they are there. You peel away the tab on the front of the unit to expose the fragrance vents. Then, you remove the small area of adhesive and stick it to the bed underneath the sheets. You can place them at the head or the foot of the bed. I love anything with fragrance that will keep my sheets or room smelling fresh. I even put one on my son's bed, and he hasn't even noticed it's there, but you can tell there is a subtle fragrance to his sheets. With the order of every online Bed Bouquet product, a free Bed Care eBook is included. 1. Visit Bed Bouquet. Look at some of the tips on bedroom design and aromatherapy. Come back here and leave a comment on this post telling me your favorite tip. After you do #1, you may do any or all of the following for extra entries. Please leave a separate comment for each extra entry, and a link if a tweet or post is involved. 3. post a link to this giveaway on facebook. 4. post a link to this giveaway on twitter. This review was brought to you on behalf of Family Review Network. The product for review and prizes are provided by Bed Bouquet. As gross as it sounds, the mattress cleaning tip was great about the dust mites, etc. I'm thoroughly grossed out now though. According to your "About Me" page you're a Narnia fan! That's awesome because, on my blog, I'm giving away three free copies of a new book that I think us Narnia fans are going to love. It's called Curse of the Spider King, by best-selling author Wayne Thomas Batson and Christopher Hopper. If you're interested, Click here to check it out! the bed bug tips. gives me the creeps. I like this tip about getting rid of bedbugs:"Don't Let them spread -Giving your infestation to your neighbors is easier than you think. Especially since, when treating, bed bugs will be encouraged to find other hosts (they can travel up to 100 yards!). Take steps to make sure they don’t get away from your treatment plan." That made me laugh and cringe all at the same time! I like the tip to take your mattress outside and give it a good thwacking! Fun and it helps rid it of dustmites and other junk! I remember my grandparents taking their mattresses out side in the summer and putting them over the clothes line. They usually did this in early summer/late spring. Now I see why they did it!! Daddy, Do You Miss Mayberry?